On Nov. 3, Gov. Peter Shumlin, Vt. Agency of Human Services Secretary Hal Cohen, and Vt. Dept. of Children and Families Commissioner Ken Schatz announced that the average Low Income Home Energy Assistance Program (LIHEAP) benefit will increase for most eligible households this year. Last winter the average benefit was $699. That will rise to $865 this year. The state anticipates receiving approximately $18.9 million in federal funds for this year’s LIHEAP program. These funds will help over 21,500 low-income Vermont households to heat their homes this winter by paying a portion of their home heating bills. “Most Vermonters will get a higher fuel benefit this year because fuel prices have remained steady while caseloads have been going down,” said Secretary Cohen. “This program is critical to keeping Vermonters with lower incomes warm this winter,” said Commissioner Schatz. The average cost per gallon remains at $2.11, while the average number of gallons that can be purchased with this year’s higher average LIHEAP benefit has increased this year from 331 to 410 gallons. This represents an estimated 54 percent of fuel cost covered for these households, up from 43 percent in the 2015/16 season. Households may be eligible for fuel assistance if their gross household incomes are equal to or less than 185 percent of the federal poverty level (approximately $45,000 for a family of four). Residents can be eligible whether they own their homes or rent. The resources they own (e.g., savings accounts, retirement accounts, and property) will not be counted against eligibility. For more info visit dcf.vermont.gov/benefits. Green Mountain Power (GMP) is continuing its long tradition of helping people with heating emergencies by donating $130,000 to the statewide WARMTH program. For 30 years, WARMTH has helped families who are facing heating emergencies and are not able to find help through other channels. More than 90,000 families have received funds totaling more than $5 million, and another 54,000 households have received essential information and counseling that helped them avoid heating crises. Funds are paid directly to the fuel or energy supplier, and each household receives no more than $225 in assistance per year. The state’s five community action agencies manage the funds, ensuring that every dollar donated goes directly to a Vermonter in need. GMP customers will receive a WARMTH brochure with their November and December bills with information on how to donate. Vermonters who may be eligible for assistance through the WARMTH program can call 2-1-1 for confidential information and referral to community resources. Additionally, Green Mountain Power and Vermont Gas customers who meet income guidelines may be eligible for a discount on their monthly utility bills. 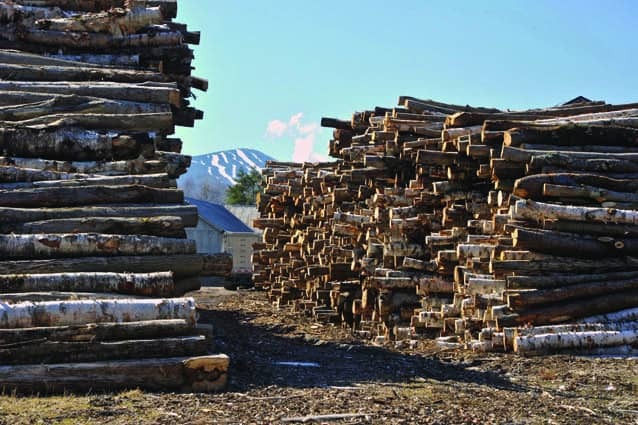 Freshly cut timbers are stacked at Colton Enterprises in Pittsfield, waiting to be kiln dried for winter.